The Hydroponic Nutrients Ebook is here! 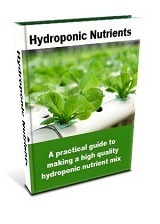 I’ve written this Ebook to be a “no nonsense” informative guide to applying hydroponic nutrients that will help you get the most out of your hydroponic garden. The book is now available and can be found here.